BT Sport have had their crack at it, ITV stand in wait, while now it is the turn of Sky Sports to lighten the pockets of thousands of British fight fans. In return they will offer a short but eloquent undercard, setting up a main event that will offer similar effects to a ride at Alton Towers, exhilarating, brief and leave you wanting more. Anthony Joshua has become the ultimate thrill ride in boxing. Opinions of him differ, a vast majority blindsided one way or another. To the casual fight fan he is the second coming of Mike Tyson, an unstoppable force who will go down as one of the greatest. While there are those polar opposites who critique every move he makes, giving off the impression that perfection is essential to being a world-class boxer. The truth however, as is often the case, lies somewhere in-between. Joshua 21-0 (20KO’s) is a remarkable athlete with power that would cause a threat in any generation. In 21 fights he has a notable number of big wins on his resume, certainly a resume that beats what Deontay Wilder and Tyson Fury have to show on paper. But he is not without his faults, not quite robotic, but Joshua does not possess great fluency to his game, he can certainly be out-boxed and during his world championship reign he has met some far from appealing adversaries. On Saturday night his opponent seems all made for the Londoner to walk through in impressive and crowd pleasing fashion. But that is not because Povetkin 34-1(24KO’s) is light work, he is a highly rated fighter, and mandatory challenger to AJ’s WBO title. Povetkin’s only loss came on points in one-sided fashion to Wladimir Klitschko. And lest we forget that prior to consecutive failed drugs test he was fancied by many as the man to dethrone Deontay Wilder of his WBC crown. But now his status has been skewered, and he has aged, looking like a Heavyweight who has seen his best days wasted more and more as the fights have passed. Now at 39, his 6’2” frame is made for a prime Joshua to re-assert his explosive style upon. 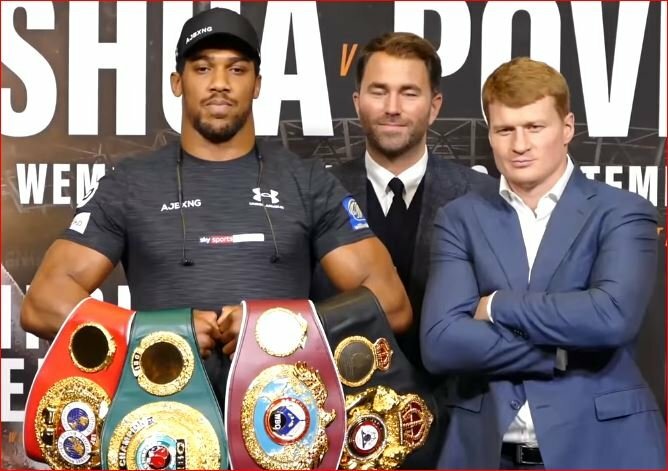 Povetkin hits hard enough for Joshua to respect, but his size should allow for Joshua to be a little more care free than he has in his latest outings as unified champ. But while Povetkin is a commendable challenger, you will be hard pressed to find many boxing fans buying the worried looks and comments from the Sky Sports panel as they attempt to assure fans that AJ is in subterranean terrain with his Russian antagonist. Joshua won’t have to get out of 2nd gear, while Povetkin will not be permitted to, as Joshua finds the target with the right hand and left hook as early as the third round. Povetkin will navigate himself through a few early quandaries, but by the 6th round and after a duo of trips to the canvas, Povetkin will be halted. Luke Campbell’s rematch with Yvan Mendy has a very dissimilar look to when the pair first met in late 2015. That night, on the undercard of Joshua vs Dillian Whyte, Campbell was dropped in the 5th before losing a split decision to the unheralded Frenchman. Mendy 40-4-1(19KO’s) was a substantial step up for Campbell then, but following Campbell’s narrow loss to Jorge Linares last year, this time it is more of a step backwards. Campbell 18-2(15KO’s) has significantly improved, while Mendy’s progression has gone under the radar with all 7 of his subsequent fights being victories in his motherland. Mendy’s most prominent win came when he dominated Francisco Patera 6 months after upsetting Campbell, but his capturing of the WBC Silver Lightweight title has left him on the verge of a maiden world title fight. But a handsome payment in the rematch may go some way to compensating a case of coming so close but so far. Campbell can avenge the loss that took away his ‘0’, beating Mendy on points. The best fight of the night comes in the form of a British Cruiserweight title fight between champion Matty Askin, and AJ protégé Lawrence Okolie. The undefeated former Commonwealth ruler is fresh off back-to-back national successes over Isaac Chamberlain and Luke Watkins, while Askins 23-3-1(15KO’s) is in the form of his life following four straight wins over Simon Barclay, Tommy McCarthy, Craig Kennedy and Stephen Simmons. Three of those coming inside the distance. His three losses leave nothing to be ashamed of either, in 2012 he was far too green for Jon Lewis Dickinson, before coming up short against the world-class Krzysztof Glowacki in round 11, then he was scarcely beaten by the seasoned Ovill McKenzie following two point deductions. This is a step up for Okolie 9-0(7KO’s), but his obstinate frame makes him a tough opponent for the champion. Okolie can get the job done, but not without a struggle, coming on strong to take the title on the cards. Finally Russian banger Sergey Kuzmin 12-0(9KO’s) looks to put his name on the map when he meets an invigorated David Price. Kuzmin’s biggest test came to an abrupt end in the 3rd round when he met Amir Mansour, but now he must meet the giant but susceptible Price. Price 22-5(18KO’s) feels he has the bit back between his teeth having been the victim of numerous drug cheats in previous heavy knockout defeats. But much of his confidence may be residing in the 3rd round knockdown that was scored against Povetkin last time out. But it was the later devastating knockout in the 5th that many hoped would have been an eye-opener for Price to walk away. The optimism is that Price erases those bad memories with a salient win of his own here, but his new-found confidence may be to his detriment as he is taken out around the halfway mark by the heavy-handed Kuzmin.